Napoleon adds to their wood burning collection with the Napoleon Oakdale™ EPI3 wood inserts. 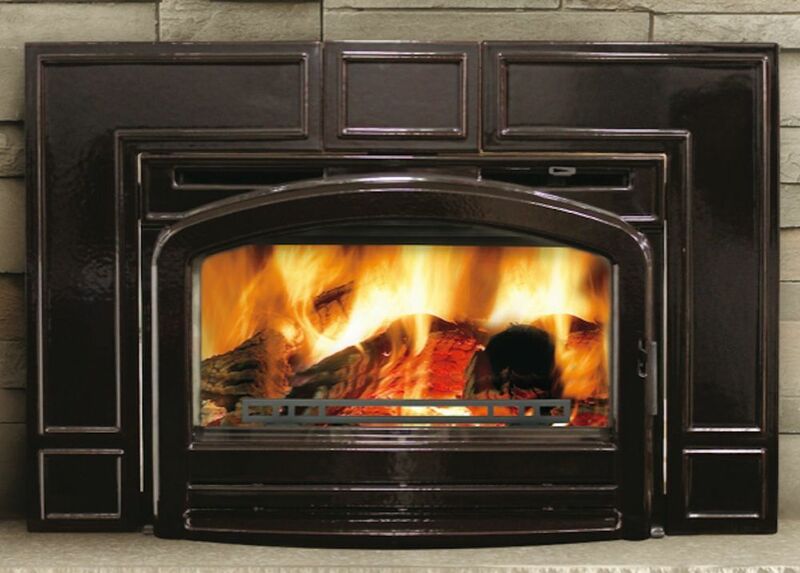 The EPI3T has a traditional flush front with a cast iron surround and the EPI3C has a contemporary flush front with a cast iron surround. The EPI3’s give customers the option of a wood burning insert that will match any décor, whether it be traditional or contemporary. Four stainless steel secondary air tubes supercharge the fuel burning process and generate a beautiful display of YELLOW DANCING FLAMES®. 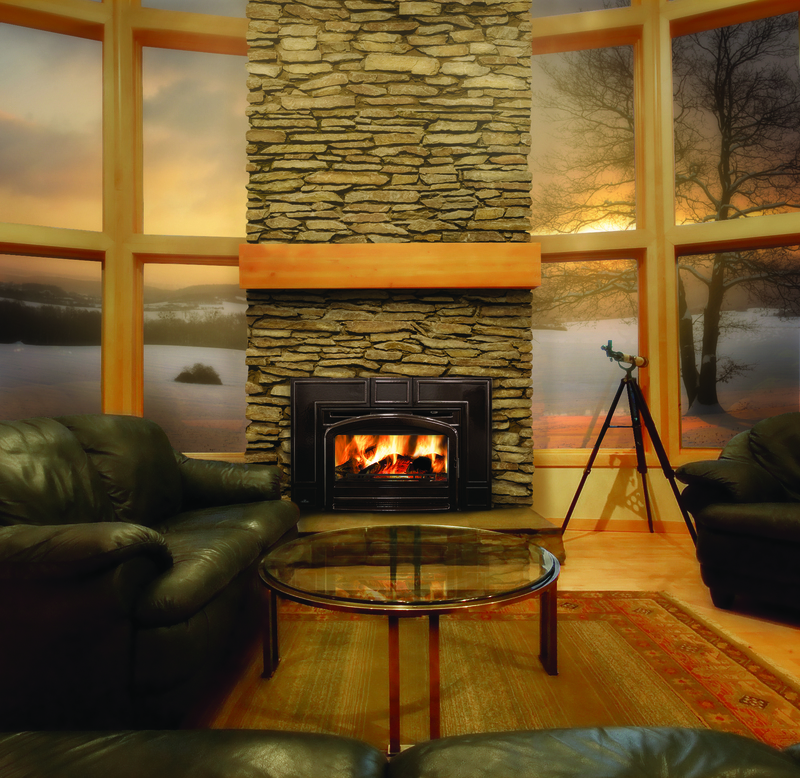 Complete with a removable painted black log retainer and a heat circulating blower, both the EPI3T & EPI3C are perfect heating solutions for your home or cottage. - Largest ceramic glass viewing area in the industry, 300 sq. in. Heating Square Footage: 1,500 sq. ft.
Firebox Volume: 1.8 cu. ft. The following materials and workmanship in your new NAPOLEON® wood appliance are warranted against defects for as long as you own the appliance. This covers: combustion chamber, heat exchanger, ceramic glass (thermal breakage only), gold plated parts against tarnishing, porcelainized enameled components, aluminum extrusion trims, vortex baf? es, ash drawer and iron castings. Electrical (110V) components and wearable parts such as blowers, thermal switch, switches, wiring, ? rebrick, stainless steel baf? e retainer, secondary air tubes, and gasketing are covered and NAPOLEON® will provide replacement parts free of charge during the ? rst year of the limited warranty. * Labour related to warranty repair is covered free of charge during the ? rst year. Repair work, however, requires the prior approval of an authorized company of? cial. Labour costs to the account of NAPOLEON® are based on a predetermined rate schedule and any repair work must be done through an authorized NAPOLEON® dealer. Parts such as ? rebricks and baf? es should routinely be removed by the operator as part of the regular service and therefore, any warranty replacement of these parts does not qualify for any labour allowances. * Construction of models vary. Warranty applies only to components included with your speci? c appliance. NAPOLEON® warrants its products against manufacturing defects to the original purchaser only. Registering your warranty is not necessary. Simply provide your proof of purchase along with the model and serial number to make a warranty claim. Provided that the purchase was made through an authorized NAPOLEON® dealer your appliance is subject to the following conditions and limitations: Warranty coverage begins on the date of original installation. This factory warranty is non-transferable and may not be extended whatsoever by any of our representatives. 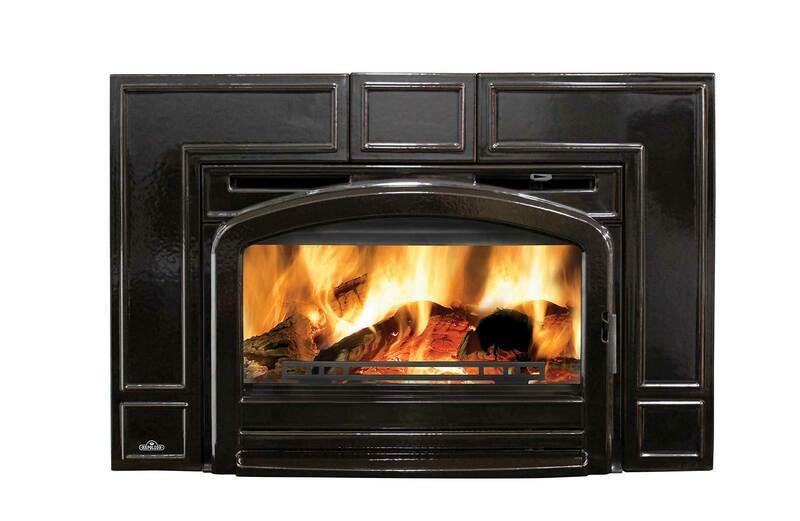 The wood appliance must be installed by an authorized service technician or contractor. Installation must be done in accordance with the installation instructions included with the product and all local and national building and ? re codes. This limited warranty does not cover damages caused by misuse, lack of maintenance, accident, alterations, abuse or neglect and parts installed from other manufacturers will nullify this warranty. This limited warranty further does not cover any scratches, dents, corrosion or discoloring caused by excessive heat, abrasive and chemical cleaners nor chipping on porcelain enamel parts, nor any venting components used in the installation of the appliance. This warranty extends to the repair or replacement of warranted parts which are defective in material or workmanship provided that the product has been operated in accordance with the operation instructions and under normal conditions. After the ? rst year, with respect to the President’s Lifetime Limited Warranty, NAPOLEON® may, at its discretion, fully discharge all obligations with respect to this warranty by refunding to the original warranted purchaser the wholesale price of any warranted but defective part(s). After the ? rst year, NAPOLEON® will not be responsible for installation, labour or any other costs or expenses related to the reinstallation of a warranted part, and such expenses are not covered by this warranty. Notwithstanding any provisions contained in the President’s Lifetime Limited Warranty, NAPOLEON’s responsibility under this warranty is de? ned as above and it shall not in any event extend to any incidental, consequential or indirect damages. This warranty de? nes the obligations and liability of NAPOLEON® with respect to the NAPOLEON® wood appliance and any other warranties expressed or implied with respect to this product, its components or accessories are excluded. NAPOLEON® neither assumes, nor authorizes any third party to assume, on its behalf, any other liabilities with respect to the sale of this product. NAPOLEON® will not be responsible for: over-? ring, downdrafts, spillage caused by environmental conditions such as rooftops, buildings, nearby trees, hills, mountains, inadequate vents or ventilation, excessive venting con? gurations, insuf? cient makeup air, or negative air pressures which may or may not be caused by mechanical systems such as exhaust fans, furnaces, clothes dryers, etc. Any damages to appliance, combustion chamber, heat exchanger, plated trim or other component due to water, weather damage, long periods of dampness, condensation, damaging chemicals or cleaners will not be the responsibility of NAPOLEON®. NAPOLEON® reserves the right to have its representative inspect any product or part thereof prior to honouring any warranty claim. All parts replaced under the President’s Limited Lifetime Warranty Policy are subject to a single claim. During the ? rst 10 years NAPOLEON® will replace or repair the defective parts covered by the lifetime warranty at our discretion free of charge. From 10 years to life, NAPOLEON® will provide replacement parts at 50% of the current retail price. All parts replaced under the warranty will be covered for a period of 90 days from the date of their installation. The manufacturer may require that defective parts or products be returned or that digital pictures be provided to support the claim. Returned products are to be shipped prepaid to the manufacturer for investigation. If a product is found to be defective, the manufacturer will repair or replace such defect. Before shipping your appliance or defective components, your dealer must obtain an authorization number. Any merchandise shipped without authorization will be refused and returned to sender. Shipping costs are not covered under this warranty. Additional service fees may apply if you are seeking warranty service from a dealer. Warranty labour allowance is only for the replacement of the warranted part. Travel, diagnostic tests, shipping and other related charges are not covered by this warranty.